Sometimes I really have no idea how to start a post. Sometimes I just have to start writing to get the words out and the flow going. Sound familiar to anyone else? In the 1900’s the chances of developing cancer was 1 in 500. In the year 2009 that chance rose to 1 in 2.5. There are more overweight people in the world than underweight. The top 3 killers in the world are cancer, heart disease, and stroke. And all of these things are more curable than most people think. If you had the choice, wouldn’t you do something to reduce your risk? Grow younger, feel better, be better. It’s possible. 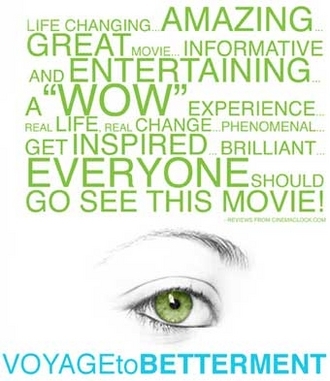 Two weeks ago I attended a showing of a recent documentary called, The Voyage to Betterment. I think it was one of the most influential documentaries I have seen and I’m wholeheartedly willing to make a change on that road to that betterment. This film is great for many, many reasons. It is a real-life guide to you being the change in yourself, for yourself, but not by yourself. Chapter by chapter, the film gives examples and suggestions to make changes in your life for creating a happier, healthier, more energetic you. The documentary follows a group of 8 people, varying in ages, gender, ailments, weights, etc. After taking a baseline of their health (weight, blood pressure, full blood workout), the participants showcased what implementing minimal changes can greatly affect a person’s health. Each chapter of the film focuses on a different minimal change and makes some suggestions on how to live a slightly different (healthier) way. For example, two of the men in the documentary were close to becoming diabetic, their chances of heart disease were certain if they didn’t change something, and they were overweight. This is where the 30 Day Challenge came/comes in. Their challenge was not a specific diet and not a specific program. However, the goal of the challenge was/is to eat a primate diet, consisting of mostly plants, around 95% plant based diet, limit alcohol consumption to one drink a day, drink more water, and cut out the processed foods. Yes, they can still eat animal meats/proteins but try to limit those. Maybe eating meat twice a week, not two to three times a day. One chapter of the documentary (and about the challenge) even had everyone gathered together learning how to make some incredible vegetable based stir fry dishes and other wonderful meals. Speaking of wonderful meals, I’ve made a lot of them and they are fantastic! I got raved reviews from my family and am definitely planning on sharing the recipes with you. That is just one part of the challenge and one part of what the film is about. The documentary touches on different aspects of life, which I mentioned before. Some of those aspects include detoxing the stress and anger in your life… This is a film for everyone, even skeptics. It’s for those who are not familiar with healthful eating, energy medicine, or holistic approaches to living. It was encouraging and inspiring, but the ideas were nothing new. Most of us know what we should do but how to implement these into our lives is the part where we get stuck. This is where the film helps. This film takes the what, which you already know about, and gives you the why and how. Why would we want to make any changes and how exactly do we make them? The chapters in this documentary, or the Ten Principles of Wellness, help to guide you through different parts of life. Through your voyage to betterment. This video isn’t preachy. It isn’t trying to convince you of anything. It’s just trying to open your eyes to something different to help mankind or even just yourself. There is no right. There is no wrong. There is only you trying for betterment. I feel incredibly strongly with this one because I value my health and the health of our society. There’s so much suffering in the world and a lot of it can be cured with diet alone. We might know what to do but we don’t have a clue HOW to do something about it. Obviously I’m into health, I’m a personal trainer and health food freak. My mission is to share my knowledge and passion to change all the illness and disease and discomfort in each of our communities. This documentary almost puts my feelings onto the big screen. That’s my story. What’s yours? What are you passionate about? Is there something, a movie, book, documentary, information that has really resonated with you? What is your mission for the world… or your life? Yes, it is good and worth a watch by everyone. You focused on the food/diet especially, and the spiritual aspects toward the end of the documentary are incredible. The introduction to “mainstream” America in such an open format about energy medicine and those gifted with what-can’t-be-seen is timely. Cool post Lori. Have you seen Forks over Knives, or Fathead? This sounds like an amazing documentary!! Thanks for sharing this Lori. I am glad there are documentaries out there that promote this well being. We need more of it!! This is so interesting, it’s great that movies like this are making it out there. I think that my goal is to be truly happy and live life as if we are all one big family, in this global world we are all so connected that everything you do influences everyone else. I think that my mission for the world is to live in the right connection between us, and to unite. because this is the only thing that can bring the solution for every trouble in the world. Next post: Double Chocolate Chunk Granola? There’s an Enjoy Life Foods review for that.